iMovie ‘08 was one of the most controversial Apple products in recent memory. While touted as a rewrite of iMovie HD aimed at making the program more accessible, it was widely (and justifiably) criticized for lacking many features found in its predecessor. During Tuesday’s Macworld Expo keynote, Apple essentially admitted as much, touting the updated iMovie ’09 as a release dedicated to adding depth and power to iLife’s video editor. And while the latest version of Apple’s movie-making program won’t please everyone, it appears to be a dramatic improvement that even bests iMovie HD in many ways. Given that iLife ’09 won’t be available until later this month, we haven’t had much hands-on time with iMovie ‘09. But by visiting Apple’s booth on the Expo show floor and sorting through the information on the iMovie product page, we’ve been able to glean more information about the new version—including things Apple didn’t promote during the Expo keynote. iMovie ’09’s Project Library has received a useful new interface. Instead of just a textual list of projects, you get a “filmstrip” preview of each project. You can scrub through each project, and even play it, right in the Project Library—the feature works just as it does while editing a project. After choosing a project, the Library display slides out of view. Another useful library-viewing feature is a full-screen browser that lets you browse your projects or clips using the becoming-ubiquitous Cover Flow interface; from this view, you can select a project or clip or play it. While the project editor works much like it did before, new options are available—via a pop-up menu—when you drag a clip onto an existing clip. (Which options appear depend on whether or not you’ve enabled iMovie ’09’s advanced-editing option.) Several commands—Replace, Replace From Start, Replace From End, and Replace From Playhead—let you replace part of the existing clip with the new clip, choosing which part is replaced. An Insert command splits the existing clip and places the new clip in between. And Audio Only and Cutaway insert just the audio or video portions of a clip, respectively. Transitions are also improved in iMovie ’09. For starters, when applying a transition to two clips, the transition can either overlap with the parts of the clip you’re using in the video, or it can take extra bits from the unused portions of the clips to keep from cutting off anything you want to be visible. But even more useful is the new Precision Editor, which lets you fine-tune the transitions between clips. Specifically, it gives you a zoomed-in view of each transition, letting you tweak both the transition point between the clips and the relative positions of the clips at the point of transition. You can even choose different transition points for the audio and video tracks of the two clips. The new Precision Editor lets you fine-tune transitions between clips. It’s a most-welcome addition to iMovie. Depending on the transition type, the Precision Editor also provides other options, making them easier to use than in iMovie ’08. For example, you can adjust the length of a transition by dragging either end of it; in iMovie ’08, such an edit required you to right-click on the transition, choose Duration, type a duration (such as 2.3 seconds), click on OK, and then see if the duration you specified is actually what you wanted. You can also edit audio transitions. The killer feature of iMovie ’09, in my opinion, is image stabilization. iMovie analyzes your video, comparing every frame—pixel-by-pixel—with several surrounding frames to determine the amount of shaking. The program then applies image-stabilization technology to remove the jitter, resulting in a remarkably stable image. Once this process is complete, video in an event is played back in its original form, but once you drag a clip to a project, you can immediately see the stabilized video. It’s hard to show off an image-stabilization feature on a static Web page, but Apple offers this side-by-side comparison. Jittering has been removed from the shot on the right, for a more stable image. The downside to image stabilization is that it takes time: up to eight times the length of a clip to analyze that clip. Luckily, iMovie gives you several options for when the process occurs: The program can automatically analyze video when it’s imported, or you can manually initiate the process on all raw video in an event or on just the clips used in the project. (The last option is much faster, but it means that you won’t be able to view the stabilized video while you’re creating your project.) Also, some clips are too “jumpy” to be stabilized; these are indicated by red, wavy lines on the clip. Picture In Picture is an interesting effect—it lets you add a second clip to an existing one, displaying the former in a picture-in-picture box you can resize and reposition. Another is Greenscreen; if you film in front of an actual greenscreen, you can change the clip’s background, just as they do in Hollywood. You also get a number of aesthetic effects, including vignette, cartoon, and aged film, along with 16 more. The video-effects panel and the main playback area display live previews, and you can skim either to get a quick look at how each effect looks on any part of your project. As with other effects, there’s no rendering delay when applying an effect to a clip. Unfortunately, you’re still limited to the included effects, titles, and transitions, as iMovie ’09, like iMovie ’08, doesn’t support plug-ins or other add-ons. Backgrounds are elements you can place before, between, or after clips as backgrounds for text or as filler; most are static images, but some are actually animated. You add a background—approximately 20 are provided in iMovie—by simply dragging it from the backgrounds panel to your project. You can then add text, if desired. Maps is a neat feature that lets you include an animated map that shows the “route” between two locations, Indiana Jones-style, using a live-drawn line between the points. iMovie offers both globes and flap maps; once you drag one of the map options to your project, a dialog appears for entering the start and end points. The program includes a database of countries, cities, and major points of interest, so as you type in the name of a place, all matching locations appear. iMovie places the start and end points on the map and creates the “traveling from A to B” animation, with a clip duration you specify. (If you specify only a starting location, iMovie instead creates a Ken Burns-effect clip that zooms in on that location.) A clever touch: the location dialog tells you the actual distance between your two points. 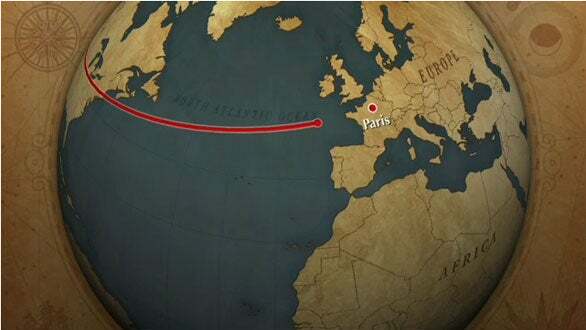 iMovie’s maps feature creates an animated map that shows the route between two locations in your video. Because backgrounds and maps are essentially clips in your project, you can apply effects to them; for example, you can give a map animation the Aged Film look to make it look like something from a classic movie. 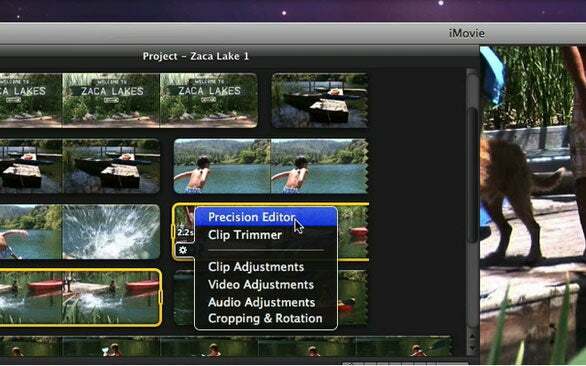 iMovie ’09 also includes project themes such as Bulletin Board, Comic Book, and Filmstrip. When you apply a theme to a project—which you can do when you create the project or at any time later—iMovie automatically creates an opening title screen (using the project’s name as the title), an ending credits screen (using the name of the current OS X user account), and transitions between clips, all based on the theme’s visuals. (Some themes let you choose transition types.) It’s also intelligent: If you add a clip to the end of the project, for example, iMovie automatically moves the end credits to the (new) last clip. 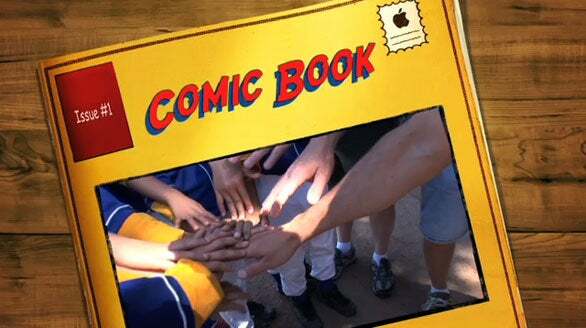 Comic Book is among the project themes introduced in iMovie ’09. Although it’s largely automatic, the themes feature does offer some customization options. For example, you can choose which transitions use the theme style and which don’t, and you can choose which frames of your movie are used if a theme has a “photo album” effect. A major omission in iMovie ’08, was the ability to send a movie project to iDVD for burning to disc; iMovie ‘09 restores this feature and improves on it. Before sending to iDVD, you can add chapter markers by simply dragging a chapter-marker icon into your project at the locations you want chapters; these chapters are transferred to iDVD. But you can also use chapters for navigating your project during editing: A handy pop-up menu lets you jump to chapter markers in the project view. A similar feature lets you add comments to your project; you drop a comment icon to a location in your project and type a comment. You can also label clips and clip segments with keywords and ratings that can be used to filter which clips you can see. Of course, that’s just an overview of a product that hasn’t even shipped yet. Once iMovie ’09 does appear at the end of January—along with the rest of the revamped iLife suite—we’ll have more details about its features and capabilities.